Welcome Barbara! You said this on one of your blogs: "In virtually every novel I have written, in any genre, some major scenes will take place in a kitchen. There will be scenes written around food, the preparation of food, the feeding of people." Seeing as I'm writing a mystery series centered on a food critic, I'm fascinated with how you work food into your books without overwhelming the story. Could you talk a little about this balance? BARBARA: It's much like real life--food is everywhere, a part of everything. Every morning, you're thinking about what to have for breakfast. Every night, you'll have to have some supper. We all have food we love and food we hate (my personal hatred is for egg whites--ask anyone and they will tell you in great detail why they hate that food!) and eating is something we all have to do. In developing character for a foodie sort of novel, it can be helpful to define each character's food profile as part of the development process, and then set them free to do what they do. Food is such a natural part of our lives, that it's easy to work it in. Working it in without overwhelming the work is like using pepper--a little goes a long way, and not everybody likes it. ROBERTA: And are you a cook yourself? What would we be having if you invited us over for supper? BARBARA: I love to cook, and in fact, it is one of the handful of things that quiets my word-centric brain and brings me back into my body. When I'm stuck on a scene or on a plot point, you will always find me in the kitchen, experimenting with a new recipe. If you were to come over for dinner in the summertime, I might serve a tomato tart with goat cheese that I adore, along with fresh bread and ice cold Sauvignon Blanc. If we were just hanging around in the backyard, it would be my mother's tacos, with soft corn tortillas and whole pinto beans, along with guacamole and fresh salsa and plenty of good beer and ale. In the wintertime, I might bake my specialty vegetarian lasagna, made with sun-dried tomatoes and goat cheese, or perhaps my favorite soup, Caldo Gallego, which is a Spanish peasant soup that sticks to your ribs and makes you beg for more. ROBERTA: Oh my, that all sounds delicious…As a psychologist and a writer, I'm also interested in your comments about how themes emerge in your work. Could you comment on the kinds of things you've watched repeat themselves in your books? BARBARA: I always say that every writer is stuck with certain ideas. As a friend of mine says, "Even when I don't think I'm writing about fathers, I'm writing about fathers." My central story seems to be about survivors--how do people survive trauma? What kinds of qualities do you need to navigate it well and be healthy on the other side? What makes people give up? It's not always a violent trauma like a car accident or a soldier who has been in battle. Often is is a life-shift that shatters a character's idea of herself. In How to Bake a Perfect Life, Ramona's trauma is getting pregnant at 15. This event turns her life upside down. In The Lost Recipe for Happiness, it is a gruesome car accident that kills everyone but the heroine. I have no idea why this is my central theme, honestly. It just is. There are other things that show up in my work over and over again--dogs and cats and gardens, the food and kitchen motifs. Animals ground us, create families even when the traditional unit might break down. Food, too, creates community and connections. I'm interested in beauty and how even the pursuit of it makes us happier. Not the shallow idea of beauty, as in beautiful faces, but planting flowers and serving food attractively and finding clothing that feels beautiful to the wearer. All of it. ROBERTA: You strike me as a writer who is in this business for the long haul. (38 books!) Could you offer some words of wisdom for writers who might be discouraged by recent changes in the publishing world. BARBARA: I'd say I'm here for the duration! I sold my first book when I was in my twenties, and that was in 1988, so I've been writing a long, long time. The upheaval in publishing is the biggest change I've seen by far. The thing to remember is that change is not synonymous with bad. The markets are changing so fast that it's uncomfortable, but I strongly believe there is always going to be work for good writers. Publishing in e, publishing in paper, publishing by voice or in graphic form--all of those formats still need content providers. That would be us. We provide content, and however the reader finds books, the bottom line is still about the story. Good stories, good characters, good writing is always what matters most. It's up to us to make the magic, and that's the true joy. If your goal is fame, to be an author, rather than a writer, attaining that in the new order might be a little more difficult. Stars will be created in new ways, mainly by the consumers. But writers will have more and more ways to make money, and in many cases, a lot more money than most rank and file writers could make in the past. It's a time to be optimistic and excited, not depressed and anxious! ROBERTA: And what can we look forward to next? BARBARA: I'm currently finishing a book tentatively titled The Garden of Happy Endings, about a woman minister who has turned her back on God. She organizes a community garden in a challenged neighborhood and helps run a soup kitchen (thus my new passion for Caldo Gallego soup!) out of a Catholic church. There is a wonderful dog, of course, Charlie, and sisters, and love stories of all kinds. It's been a challenging book to write because the central questions are big ones, but I'm finally happy with it. Bantam will publish it in trade paperback in May. ROBERTA: Thank you for being here Barbara! 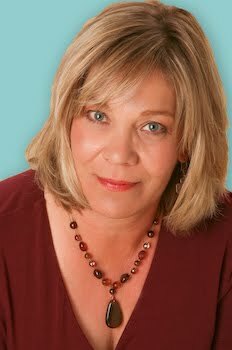 You can find Barbara on Twitter or at her website or on her excellent blog for writers, called A Writer Afoot. Now JRW, questions, comments, dates you can make it for our dinner?? Hi, Barbara - love this interview! I was speeding along and screeched to a halt at 38 books! So in awe! And I so agree: story is what matters. Wondering, how has your writing process changed since you started down this road? My main character spends a fair amount of time in a diner and I've been surprised at the way food has worked its way into my stories. It's something we all can relate to - I can relate to that tomato and goat cheese tart...haven't made one in a few years but maybe you've inspired me. Hey Barbara! I love what you said about writing about fathers..I'm just to the the "creating a life" part for a character..and suddenly, there's her father. And I'm not sure how that happened. But embracing that, I think, will be instructive...so another reason you arrived at the perfect time! We had talked at a conference about --was it Megan Abbott's idea?--about discussing what's in character's refrigerator as a good shorthand way to describe their life. It works, doesn't it? Tremendous interview! Barbara, I am really interested in your upcoming book, The Garden of Happy Endings. That subject matter or "theme" of turning one's back upon God has ever fascinated me. Great to see you here, Barbara! I remember hearing you speak at an RWA conference years ago (the first one I ever attended, I believe) and I was blown away by what you said then--and I probably still have the notes. I agree with you about the cooking: what, how (and if?) he or she cooks can tell the reader so much about the character you've written. Love the food element. It started with Nero Wolfe. Great interview. Look forward to the woman minister's story. Coincidentally, I have HOW TO BAKE A PERFECT LIFE on my TBR pile. Not because of Barbara's name or because she was going to be interviewed here, but because lately I'm fascinated by stories of women in midlife reassessing their goals and relationships. Now I'll have to add THE GARDEN OF HAPPY ENDINGS to my preorder list. It sounds tailor-made for me. I frequently make the refrigerator comment..I also think what's in her handbag or under her bathroom sink are good ways to get a quick idea of who a female character is. From there, I develop character, and from character and place come the plot. Thanks, Rosemary and Hank (waving!). M.E.--I hope you'll enjoy the book when it arrives. I was so happy to ship it off to my editor at last! Julia, the theme of women's lives turned upside down at midlife is central to all of my books. Sisters, dogs, food, midlife and decent men. What a great interview, Barbara! I can't count how many scenes I've set in kitchens. What people eat and how they relate to food--and whether or not they see beauty in everyday things--are for me central to character. And of course dogs. And cats. And gardens. So why do I write crime novels? I think because, like you, I'm fascinated by survival, by how people deal with loss or tragedy and whether or not they can find ways to go on. Debs, I'm so excited that Barbara pushed your buttons--get ready for a treat! I would add cats and one brother to your list Barbara. So Barb: Just once, wouldn't you like to write about an INdecent man? Ah Austin,ever the contrarian. I so enjoy your posts. Who's to say she HASN'T. But that was then, when life was a page as yet unwritten upon. Now? Why waste one's writing time? Hi Barbara - Somehow over at writer unboxed, I missed the 38 books stat. Mighty impressive. 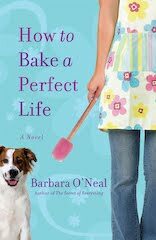 UPS just delivered How to Bake A Perfect Life yesterday, and I look forward to reading it. Anything with a dog and food on the cover gets a thumbs up in my book. And as someone who turned her life upside down at a (youngish?) midlife, I'm forever fascinated by such tales. I always joke during NaNoWriMo that when I hit a wall, my charaters either go in the kitchen to cook, out to eat or to bed. Food and love scenes, you gotta love them. I have to remember cats and dogs. I need to five them to my characters more often. Austin, I do like an indecent man once in awhile. All things in moderation. Deb, I've been on an MFK Fisher kick, myself. Have you read her? Barbara, I have read MFK Fisher, but it's been a good while. (Always want to think of her as Mary Frances as my best friend since grade school is named Mary Frances.) Wonderful, wasn't she? And I wonder where my copy of How to Cook a Wolf might be??? I'm sure you've read Ruth Reichl? More books to dig out, but I want to read yours first!